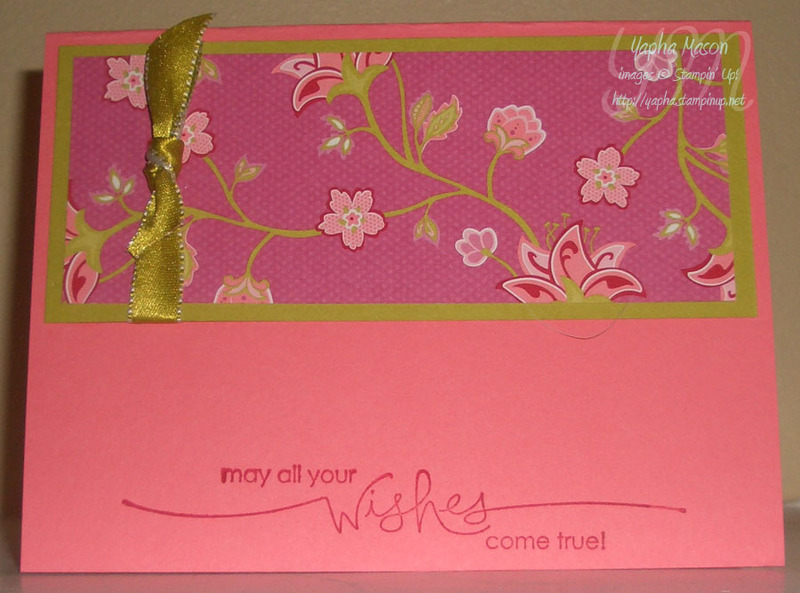 Last Days for the Scrapbooking Specials! Buy three packs of Designer Series paper and/or 12″ x 12″ textured card stock, and get one pack free! 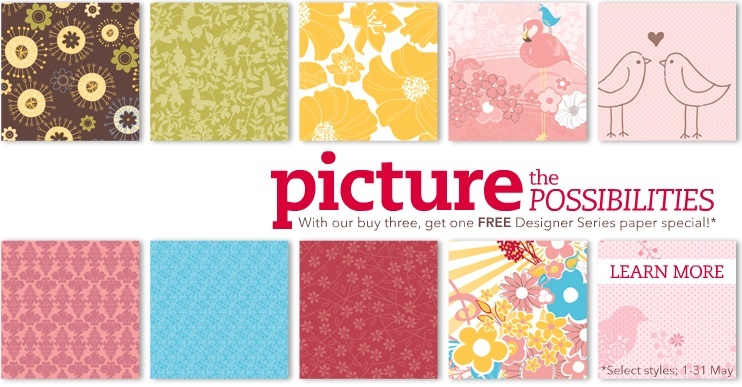 Mix and match your papers to meet all your scrapbooking and paper crafting needs. Click Shop Now on my website. Get a sneak peek into the 2009-2010 Idea Book & Catalog when you purchase the brand-new Jumble Alphabet stamp set at 20% off. 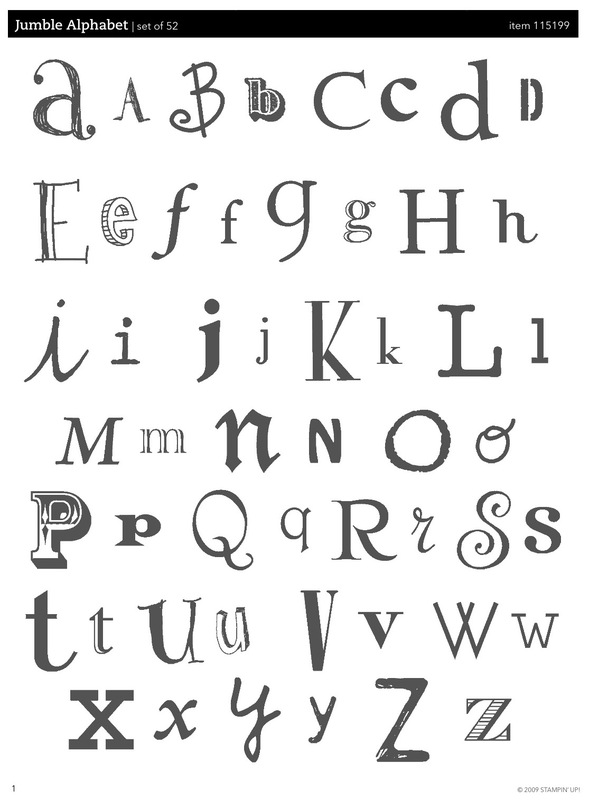 This set of 52 die-cut, double-mounted stamps is perfect for scrapbooking because you’ll never run out of letters! In July it will sell for $43.95 — buy it now for only $35.16. In addition, this specially-priced Starter Kit contains all the business supplies found in the regular-priced Starter Kit. Each of the products listed above may be substituted for like items. Please see the Scrapbooking Starter Kit Order Form for details. This is an incredible deal! You get all of the benefits of becoming a demonstrator at a low, low price! Plus, you are getting $80+ worth of product for only $75! You can join easily via my website — my password is SUwithYapha. Last Chance Lists for stamps, accessories, and Decor Elements. Accessories sell out quickly, so order early! 2009-2010 Idea Book & Catalog Sneak Peek and Hostess Set Preorder — Join today with the $75 sign up special (see above) and you can take part in this too! Check back here for more late breaking details! I used the same pattern as I did during the Parade of Paper Blog Hop. The tutorial is in this post. Here’s a close-up of each of the three cards, there are two of each in the pouch. Raspberry Tart Designer Series Paper is one of the papers on sale in the “Buy 3 Get 1 Free” special going on now through May 31st. Don’t miss out! 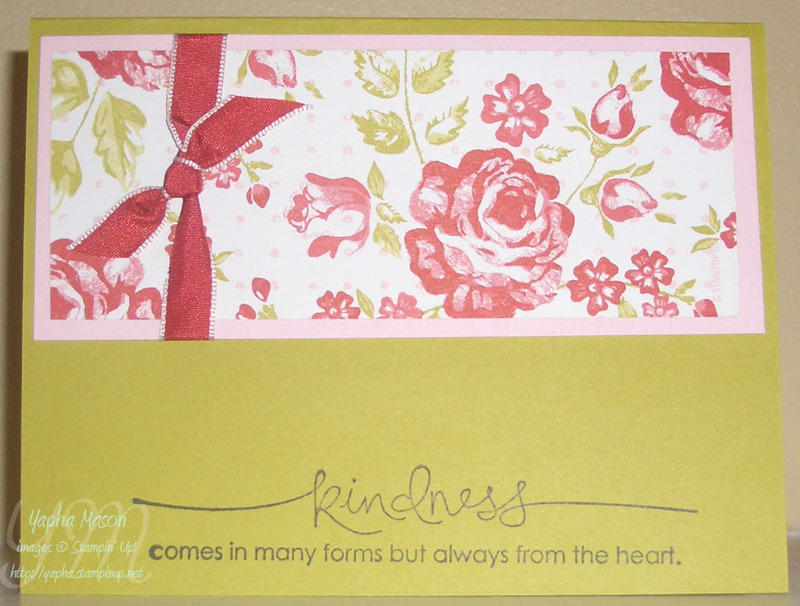 I love so many things about Stampin’ Up, but lately it has been all about the Designer Series Paper! 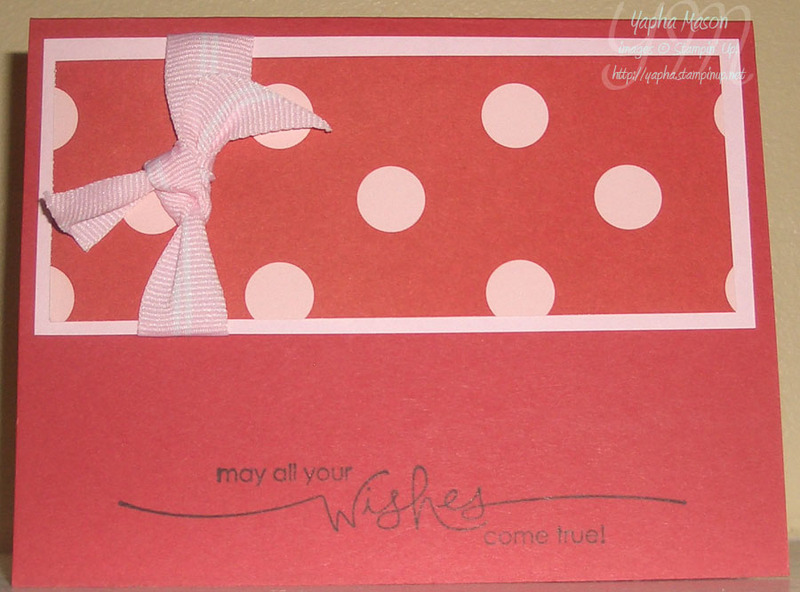 The color is so rich, the designs so yummy, it coordinates perfectly with the card stock and ink, it is just win-win all the way around! And with the coordinating colors printed right in the catalog, how can you go wrong? 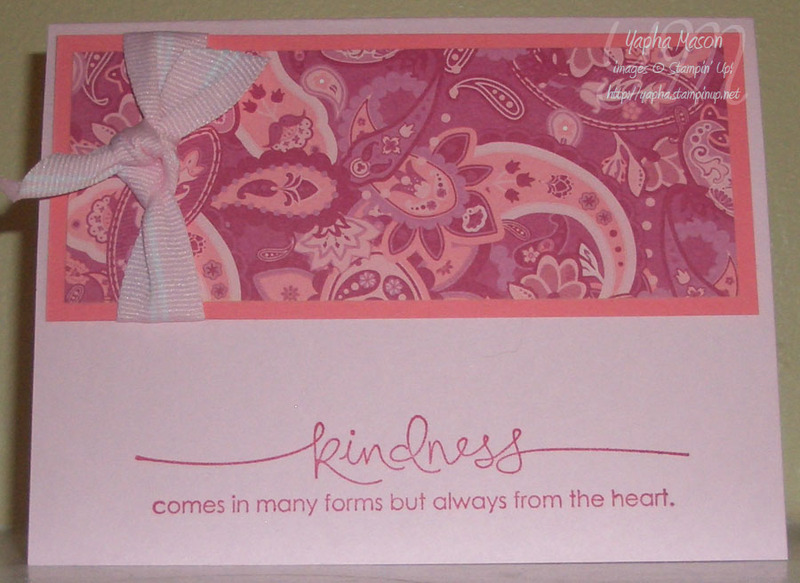 All you need to make some fabulous cards are a pack of designer series paper, some coordinating card stock, a little ribbon and a sentiment stamp set (you know, one with words). Below is a card I whipped up from that recipe. Over the next few days I’ll be showing you the end of year teacher gifts I’ve been making with these same ingredients as well. Don’t forget! 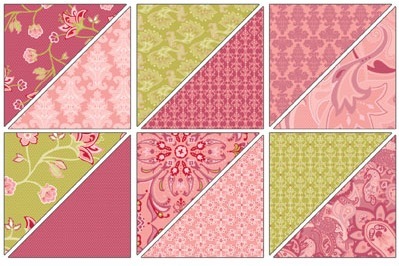 Stampin’ Up has the Designer Series Paper on sale right now! Buy 3 packs and get the 4th one free! That’s an amazing savings of at least $9.95! Hurry! Sale ends on May 31st. Order now! 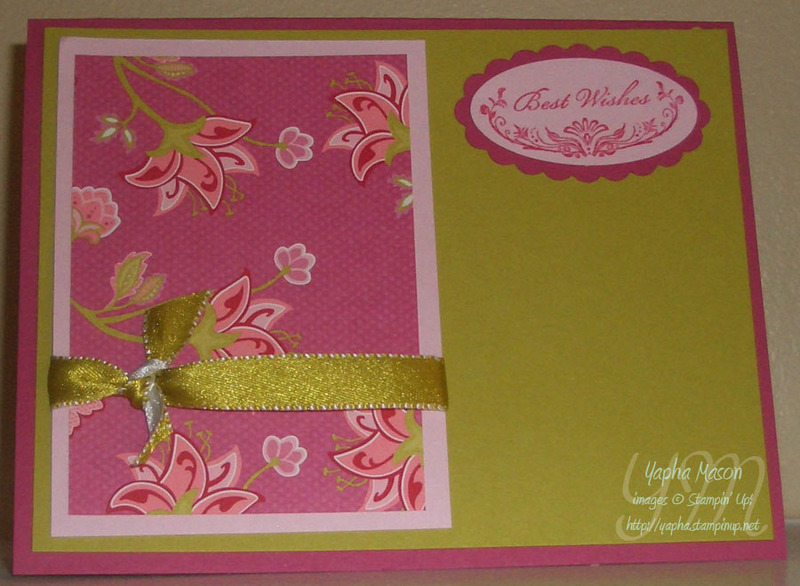 I used a Level 2 hostess set, A Little Somethin’, for this card. You know, there are only five weeks left to earn this set before it disappears forever! Check out the hostess benefits chart to see what other great benefits you can earn. Remember, you can always be your own party! Another great thing about this stamp set is how it coordinates with punches. 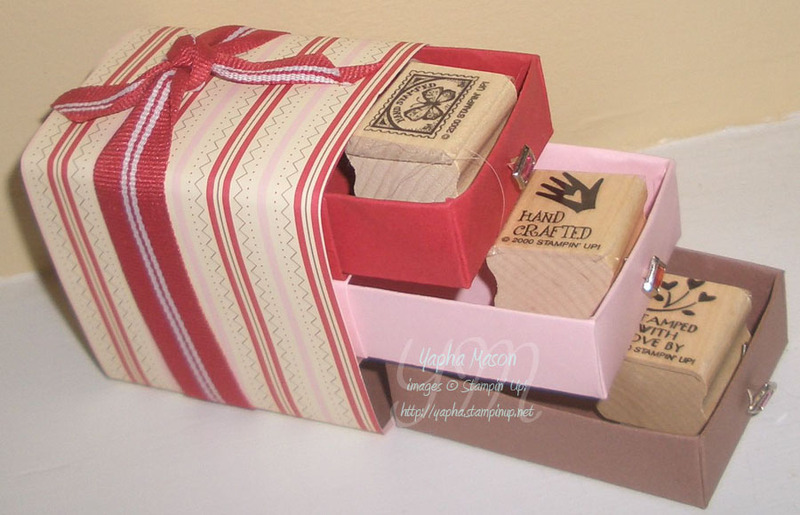 Take a look at the set below, and see if you can figure out which punches match which stamp. 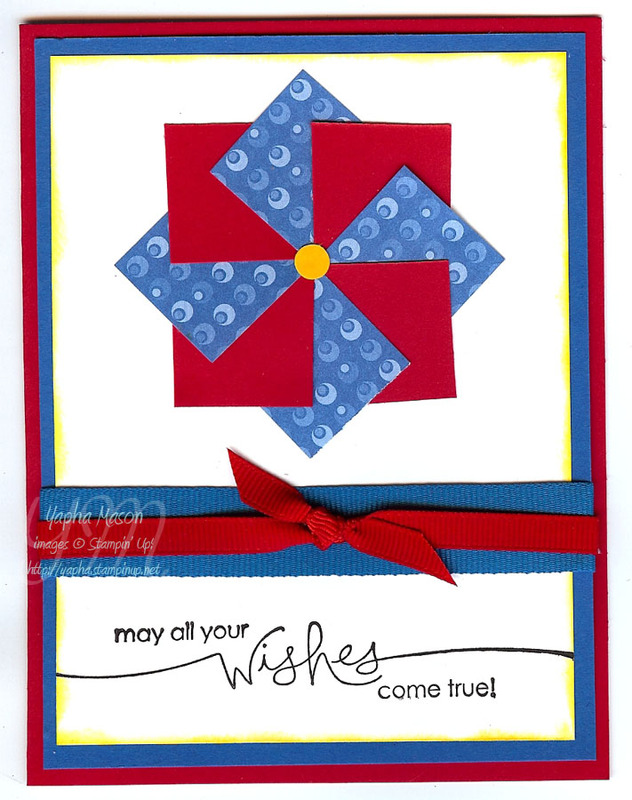 I am a little limited on stamp sets & supplies that I brought with, so I decided to make a Faux Pinwheel. Thanks to Lyssa for the great instructions on her blog! The squares I used are 1 inch on each side. The little circle of Summer Sun card stock is punched with a random hole punch that my Mom had lying around the house. Happy Memorial Day! And thank you to all those who have served or are serving our country! 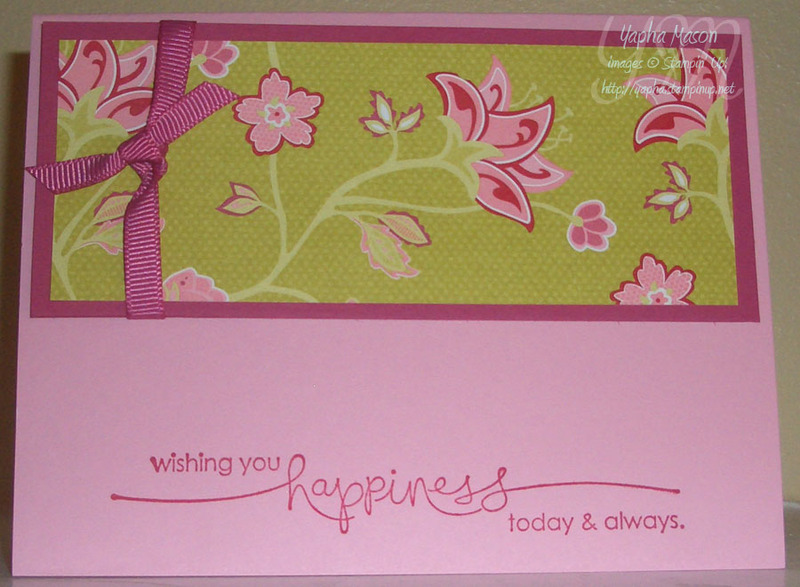 Tonight is my Fun Folds Card Class over at Sandi’s house. 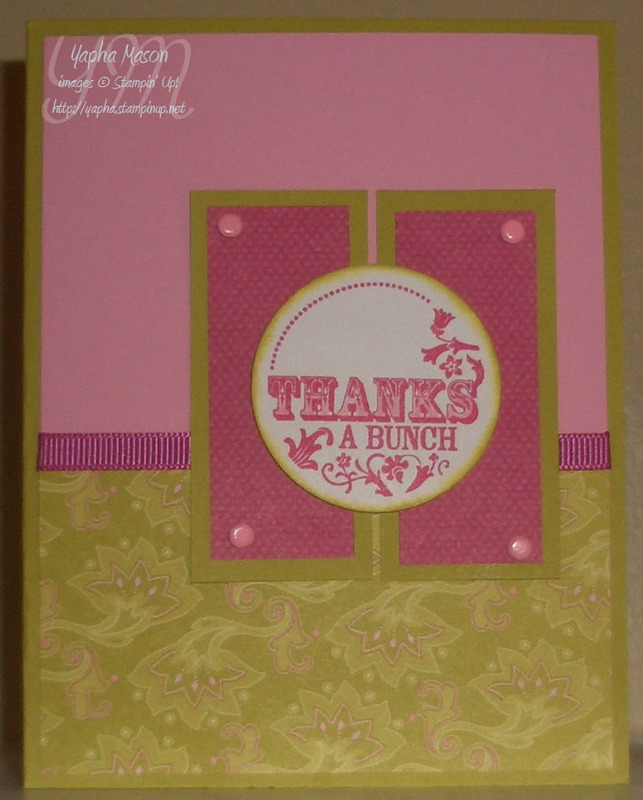 There are a lot of good reasons why you want to host a Stampin’ Up workshop or class with me. For one thing, you don’t pay the supply fee! 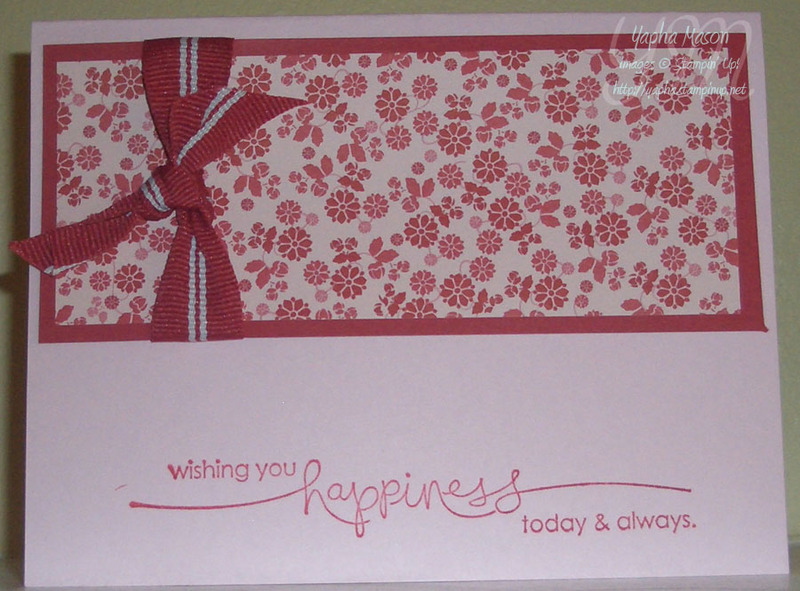 Another reason is the amazing hostess benefits provided by Stampin’ Up (take a look at those here). The third reason is that I give you a fabulous hostess gift! Tonight I am giving Sandi a super cute matchbox dresser. 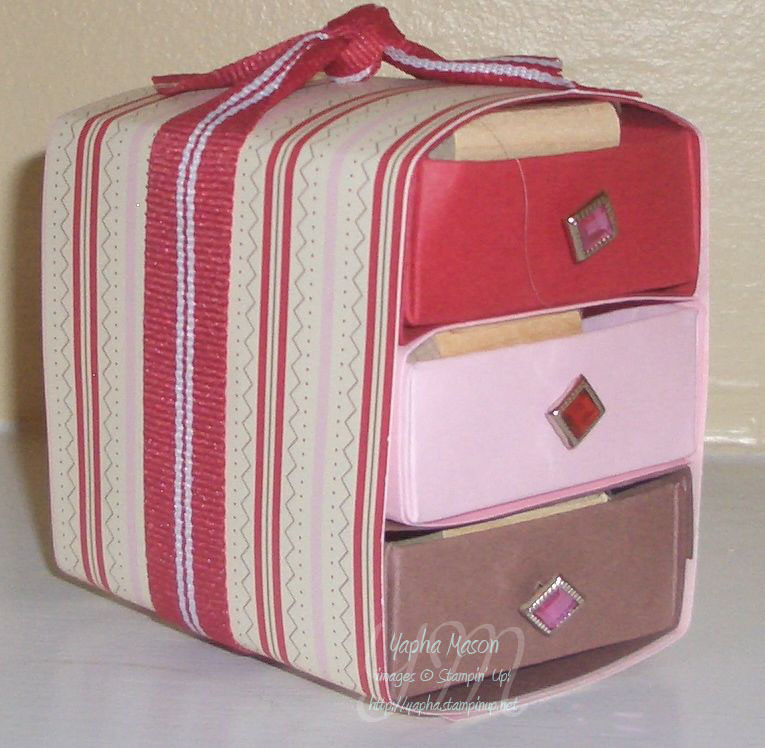 Inside each of the drawers is an incentive stamp from Stampin’ Up. These stamps are not available to purchase by customers, they are yet another perk of being a demonstrator! p.s. You can earn the same fabulous hostess benefits ordering online as well. If you order at least $150 of merchandise, you qualify for Stampin’ Rewards, which is just another name for Hostess Benefits. p.p.s. Now is an AMAZING time to sign up to be demonstrator! For only $75 you can join my team with the scrapbooking sign up special! Click Join Now and enter my password SUwithYapha.